Pfizer’s research center in Kendall Square, at 610 Main St., opened last year. 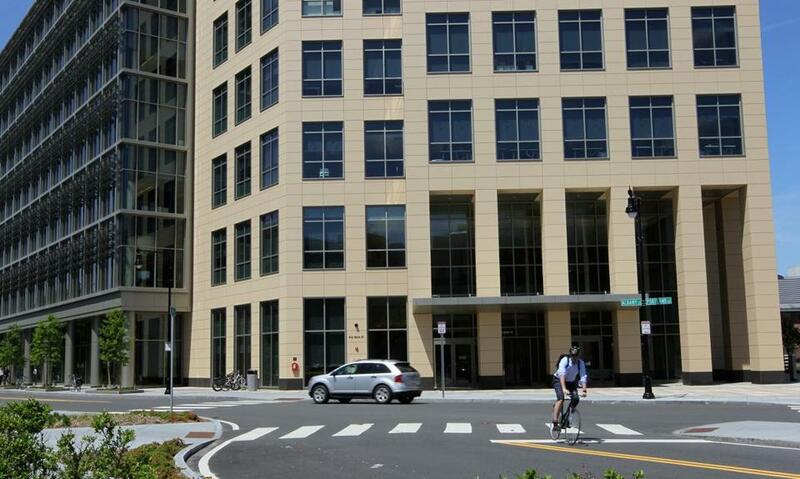 The drug giant Pfizer Inc. will consolidate operations at several Cambridge locations and move hundreds of employees into a huge, unified research campus outside of Kendall Square. The company was set to announce plans on Wednesday to lease a building under construction next door to the Cambridge research lab it opened last year, creating a 500,000-square-foot research campus at 610 Main St. When the “north building” is completed in early 2017, Pfizer will move about 280 employees from three small sites in nearby Technology Square and Kendall Square to the new structure. It will connect to the existing “south building,” where Pfizer launched its state-of-the-art research center last spring. Together, the buildings will house about 1,000 employees. Both buildings are owned by the Massachusetts Institute of Technology Investment Management Co., with which Pfizer is expanding its lease agreement. The drug maker, based in New York, does not immediately plan to add researchers or scientists. Instead, it intends to sublease about half the space in the new building to smaller biotech companies and potentially collaborate with them on drug-discovery programs. Pfizer said it is in talks with some start-ups, but declined to disclose prospective tenants. Michael Ehlers, the company’s Cambridge site leader, said the arrangement could give Pfizer the flexibility for future growth and for forging new research alliances. But he also said Pfizer is “quite interested in new forms of partnerships with others in close physical proximity,” suggesting the subleased space could serve that purpose. Pfizer’s research in Cambridge focuses on rare diseases, cardiovascular and metabolic diseases, inflammation and immunology, neuroscience, and biotherapeutic technologies. Ehlers, 46, joined the company five years ago as chief scientific officer for its neuroscience research program in Groton, Conn., and moved with the program when it was consolidated into the Cambridge research operation in 2012. He was promoted to an expanded role as Cambridge site leader and head of biotherapeutic research and development in May. Like the existing structure, the new north building will feature an open-space design intended to nurture collaborations, Ehlers said. Pfizer scientists will work on large-molecule design and bioinformatics in the new building. Not all of its Boston-area functions will be moving to Kendall Square. The company’s Center for Therapeutic Innovation, which works with teaching hospitals on early-stage research programs, will remain in Boston’s Longwood Medical Area, Ehlers said. at robert.weisman@globe.com. Follow him on Twitter @GlobeRobW.